Zip Lines – sometimes known as canopy tours – can be a lot of fun. 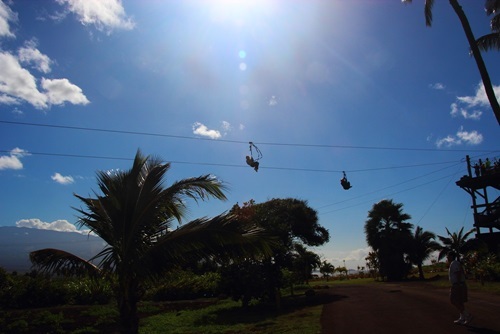 At these zip lines one can feel like he or she is flying through the rain forest. The main company that provides this adventure in Punta cana is Canopy Adventure). Canopy Adventure ZipLine has 8 double lines cables and 15 platforms. At some of these cables you can be flying at 60 km/h (about 40 miles per hour). The tour takes around 4 hours and costs about $US 90 per person. It includes a bit bumpy round trip transport, full safety briefing and equipment and some refreshments (but eat before you go). People that go are typically very happy with the experience, but on many days there are a lot of people. Also one should note that there is a bit of walking involed to get to the zipline. Note: Almost anybody can go down the zipline (there is no weight limit), but the limit for for the harness is 45 inches (114 cm) around the waist.